During the bitter fighting to hold Guadalcanal the effective use of Marine Corps aircraft for close air support of the Marines on the ground came into its own. Unfortunately due to the short legs of the fighter/attack aircraft many of the follow on island assaults had to be supported by carrier based aircraft until the airfields were captured or built, a case in point being Bougainville in late 1943. Similarly, photo reconnaissance had to be provided by long range aircraft such as the PB4Y-1Ps flown by VMD-154 and 254. In 1944 the Navy began building a large number of Commencement Bay class CVEs known as jeep carriers to provide close air support for the island campaign which at that time included plans to invade the Japanese home islands in late 1945. The Marine Corps ground commanders pressed hard to get Marine aircraft aboard them and the CMC General Vandergrift personally flew to Hawaii to persuade Admiral Nimitz to make their case. As a result the Marines were given responsibility for the aviation complement (Marine Carrier Air Group (MCVG) for the first 8 of the new CVEs which were to begin deploying to the Pacific in the Spring of 1945 from the West Coast. Four would see limited action before WW II came to an abrupt close in mid August; the USS Block Island (CVE-106), USS Gilbert Islands (CVE-107), USS Cape Gloucester (CVE-109), and the USS Vella Gulf (CVE-111). 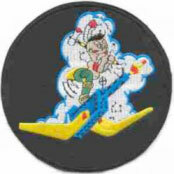 The MCVGs were notionally comprised of a VMTB(CVS) torpedo/attack squadron with TBM-3 Avengers and a composite fighter/reconnaissance squadron VMF (CVS) that included F4U-1D/ FG-1D Corsairs, F6F-5N Hellcat night fighters, and a section of 2 F6F-5P Hellcat photo reconnaissance aircraft. A carrier aircraft service division provided support. Of note the CVE work-ups of the Hellcat photo aircraft coincided with that of VMD-354 which also deployed to the Pacific in late April 1945 with F6F-5Ps to provide dedicated land base reconnaissance. There had been a gap in deployed Marine Corps reconnaissance aircraft since October 1944 when VMD-254 stood down. The USS Block Island with VMF (CVS)-511 sailed for Ulithi in the Carolines to join the Fifth Fleet on 17 April and then moved up to Okinawa and began combat operations on 10 May 1945, seeing continuous action until 16 June. The photo aircraft provided post strike reconnaissance for MCVG-1 operations against airfields and Japanese strongpoints. After a brief off line period in the Philippines, the ship departed for Borneo to support the last amphibious operation of the war, landings by the Australians at Balikpapan on 30 June. The USS Block Island was joined in that action by the USS Gilbert Islands with MCVG-2 embarked which included VMF-512 (CVS) with its F6F-5P photo section. After 3 days the ship sailed for Guam for repairs to the arresting gear and had just departed there when news of the Japanese surrender came. The USS Gloucester with VMF (CVS)-351’s photo section embarked arrived in the Philippines on 29 June 1945 and later joined the 3RD Fleet off Okinawa fighting off kamikaze planes attempting to attack minesweepers from 5 July until 17 July. The MCVG then conducted air raids and photo reconnaissance operations of shipping and airfields along the China coast until the war ended. The last of the MCVGs to deploy to the Pacific was embarked aboard the USS Vella Gulf (CVE-111). Its composite fighter/reconnaissance squadron VMF (CVS)- 513 saw action in the Marianas islands of Rota and Pagan from 24 July until 28 July. The ship then sailed north to Okinawa arriving on 9 August to news of the impending surrender and subsequently supported initial occupation operations in the Japanese home islands before returning to San Francisco with over 600 servicemen on 14 October 1945.